Come celebrate with us one of our favorite foods! BACON! The day will consist of anything and everything bacon related. This annual family-friendly event will benefit York City's oldest indoor farmers market. The festival will open with a Blessing of the Bacon. There will be children's learning activities; adult events such as, hog calling, and crowning of the Bacon President. Interested in becoming a vendor? or Do you think you have what it takes to be the Bacon President? check Facebook for details. Contest will run online from May 15th to May 31st @ 10:00PM. 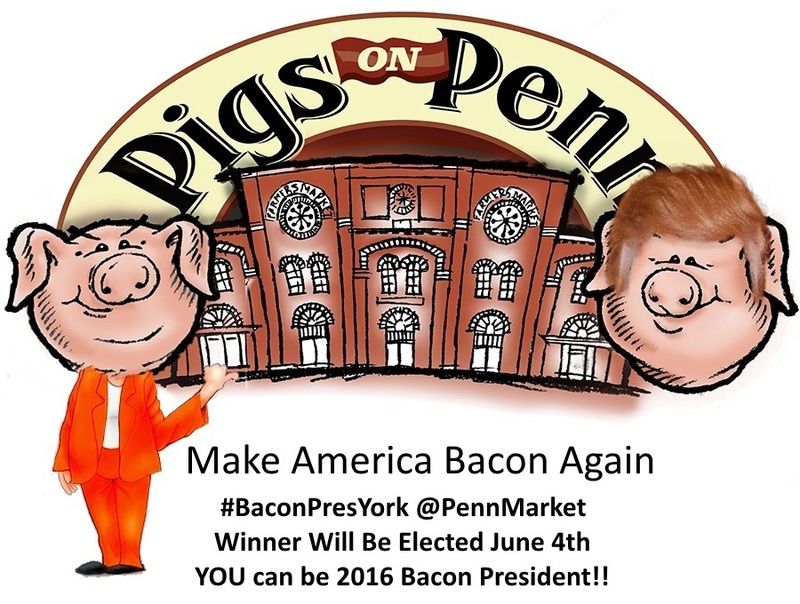 Final judging for the top 3 presidential candidates will happen on the day of the Pigs on Penn Bacon Festival, Saturday, June 4, 2016. Post a photo to Twitter that shows you demonstrating your love for bacon. Include a brief statement of why you love bacon and the corresponding #BACONPRESYORK. Photos without people will not qualify. The 4 presidential photos with the most likes at 10:00PM on May 31st will be judged on June 4 at Pigs on Penn by way of a monetary donation toward each contestant. Proceeds from the contest will support Penn Market. 2) Will ride on the WeCo float in the Halloween Parade. 3) The eternal glory of being the first-ever Bacon President. By entering this contest, participants are giving Pigs on Penn and the Penn Market permission to use and display their images.